I’ve just resigned from my last board. My term expired on the Highlights Foundation board of trustees. I never attended a meeting in person. For me it was always by conference phone. Honesdale is a bit far to travel for a two hour meeting. It was a privilege to serve with that group, which includes Chris Cully, Editor in Chief of Highlights, and Clay Winters, former president of Boyds Mills Press, and learn about what it takes to create the Highlights Workshops that attract so many writers and illustrators each year from the United States and abroad. My thanks to Kent Brown for nominating me when he was executive director of the foundation, and to his son and the new executive director, George Brown. The new board members bring strong backgrounds to the table and I’m confident that the foundation will continue to flourish and fulfill its mission to support children’s literature by supporting those who create it. For the first time since the 1980s I serve on no board or steering committee. My active years as a volunteer spanned thirty-six years. As I move toward reducing my week-day work schedule from sixty hours to thirty-five, it makes sense to trim back in other areas to help accommodate the new order. When I first posted the agenda for my poetry workshop in Honesdale the last of Sepember, we quickly had seven or eight people indicate their intention to sign on. Last year we filled the 15-person quota by April or May and it looked as though we were headed that way again this year. So far that isn’t the case. We’re still well below the maximum I can accept and here we are nearly into June. I look forward to hearing from additional poets who want to take advantage of the inspirational setting at The Barn and to benefit from Skype sessions from Kenn Nesbitt and Jane Yolen. Maybe you know of others who would sign up with you. Last year I think we had seven poets from Illinois. We were afraid they would gang up on the rest of us but they all turned out to be stellar people and talented writers. Here’s the information. http://www.highlightsfoundation.org/workshops/poetry-for-the-delight-of-it-2014 . If someone is unable to attend this year after all, I’ll look at the names in the order in which they were added. We still have more than five months before the workshop so it’s possible that a spot could open. If you want to be on the list for 2014, please let Jo know. As far as I know I’ll do another workshop next year. To everyone who will be joining me in September, thank you! I look forward to working with you! BULLETIN: OUR WORD OF THE MONTH FOR APRIL IS FRAGRANCE. Thanks to everyone for providing so much fun in March with the word “snake.” We had 164 poems and comments. It has been quite a while since we’ve had so much activity. I hope you had a good weekend. Some of you may have received a note last week from Kent Brown. Kent started Boyds Mills Press when he was editor-in-chief for Highlights. These days he heads up the Highlights Foundation and directs the Founders Workshops. His note was to encourage folks to sign up for one of the poetry workshops being offered this year on the Highlights Founders schedule. Here’s what Kent had to say. Quite a few years ago, I fancied myself a budding poet. My grandparents and my mother all spurred me on. Sometime about the fifth grade, my mother had an assignment to go down to the Carolinas and interview Carl Sandburg. She tucked into her purse one of my best poems. I don’t remember the poem, but I doubt it was more than eight lines. My mother told me she was going to share my poem with Mr. Sandburg. Well, she got to the interview, had a fascinating time, and came home to write up the interview. But, sadly, she admitted she had forgotten to present my work to the master. I drifted away from poetry after that and became a juvenile delinquent. Hated school. I got back to writing some when I was in the army, far from home. My epic work, “The Court Martial of Razzy B. Jackson,” was never published. I squeaked through college, farmed a few years, and ended up as an editor. I now know that I should have had some training in poetry. And read lots of it. And worked harder. Some little part of me wonders how it would have come out if I had schooling in poetry. And perhaps a little more humility. YOU have a chance, however. I’ve known a few poets in my day. Two I know well will be coming over to my corner of Pennsylvania this year. There is David Harrison, the only person I know who has a school named for him, and, Rebecca Kai Dotlich, a great poet and a great teacher. Also, Writing the Poetry Novel with Helen Frost and Kelly Bingham will enlighten those of you who take your word skills in that direction. Their workshops here are in April, May, and September. To secure your spot, or for more information, contact Jo Lloyd at 570-253-1192, e-mail jo.lloyd@highlightsfoundation.org , or request an application online. To view more 2013 workshops, which take place near Honesdale, Pennsylvania, please visit http://www.highlightsfoundation.org . The Highlights Foundation is a public, not-for-profit 501®3 organization. We dedicate our efforts to connecting, nurturing, and inspiring children’s book writers and illustrators. I haven’t checked with Rebecca or Helen and Kelly so I don’t know how many more they can accept. I think I can handle four more people. If you’re interested or know someone who might be, this seems like a good time to make decisions. BULLETIN: Tomorrow SUNDAY POETS returns featuring three poems by Joy Acey. Don’t miss Joy! The last piece has fallen into place for my poetry workshop at Honesdale, Pennsylvania next September 30-October 3. Three special guests will be joining me. 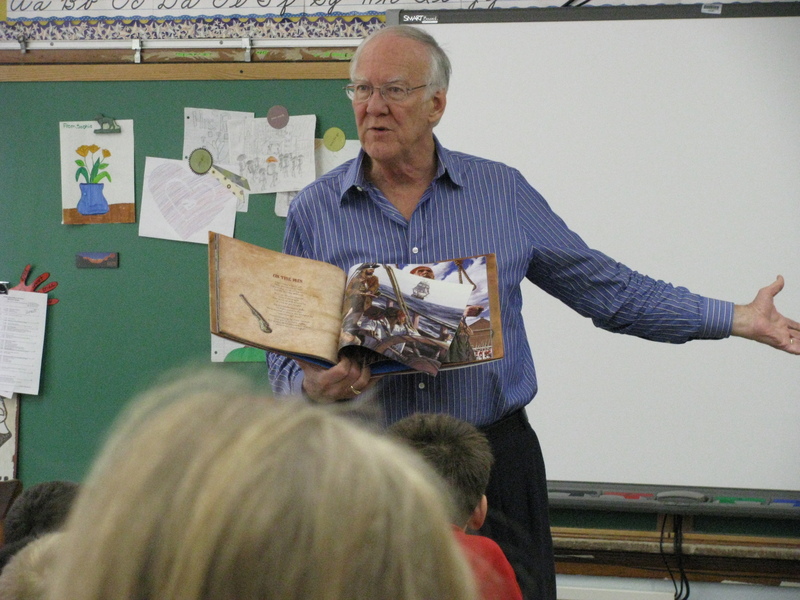 On Tuesday, October 1, we’ll be treated to a Skype visit from U.S. Children’s Poet Laureate, J. Patrick Lewis. Pat will read from his work and respond to questions. On Wednesday, October 2, we’ll be joined by Rebecca Davis, poetry editor-at-large for Boyds Mills Press/Highlights. Rebecca will discuss what an editor looks for and suggest ways to make your manuscript more marketable. And on Thursday we’ll have a Skype visit from Renee LaTulippe, she of NO WATER RIVER fame. Here’s the link to her fabulous site. http://www.nowaterriver.com . Renee will help us all become better readers of our poetry. Here’s the general description of the workshop. For more information, go to Highlights Foundation Workshops: http://www.highlightsfoundation.org . Arrive Monday, September 30, at 3:P.M. for a tour of HIGHLIGHTS FOR CHILDREN and Boyds Mills Press. Ends Thursday, October 3, after lunch. Designed For: From budding poet to published veteran, we learn and teach at every stage. If you like to think, talk, write, and share poetry, this one’s for you.